Already feeling guilty about your upcoming weekend alcohol indulgences? Thanks to a recently constructed interactive world map detailing alcohol consumption by country, you might be able to make yourself feel a little better by comparing your beer consumption to the average American. And if that doesn’t work, try comparing yourself to the hard drinking citizens of the Namibia. The map, compiled using information from the World Health Organization, allows users to mouse over any country to view milliliters of alcohol consumed broken down into wine, beer and spirits. Or click the “favorite” button to light up the entire global with a color-coded look at national alcohol preference. Not surprisingly, the French like their wine, the Russians love their “spirits” (read: Russians love their vodka), and the Germans love their beer. The average German goes through almost 2.3 liters a week (though the aforementioned Nambia puts back even more liters, drinking over 2.5 liters each on average. Take that Germans). But comparisons between other countries can be even more interesting. For instance, Argentinians are big time wine drinkers, averaging nearly a bottle per person a week, but right next door in Brazil barely touch the stuff. Your average Brazilian only drinks 47 ml of wine a week, which is less than a shot. Who knew? 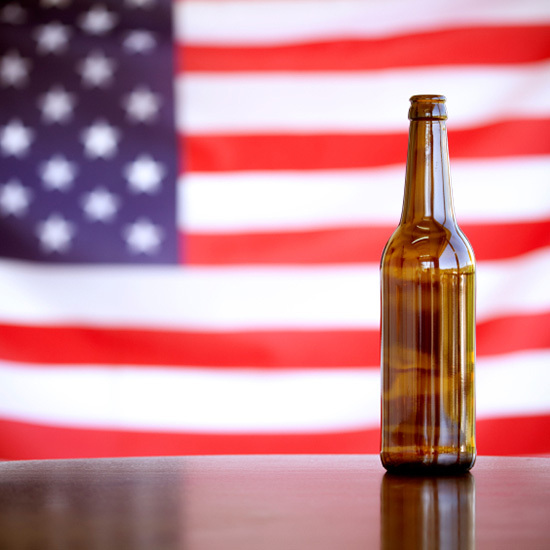 Check it out and see how you stack up against drinkers around the world. The site, designed by Piero Ciarfaglia, is sure to keep you occupied at work until it’s time to leave for happy hour. Related: Pop Quiz: Do You Drink Like a Russian or a Tongan?